Good morning world. Still no Spring. I think it is hiding under a rock somewhere don't you. Hum....where oh where could it be?!? I'm still looking for it. But until I find it, I thought I would invite you to visit me and the gals over at the "Humble Arts". We too are looooooooooonging for Spring and I think our offerings show that. 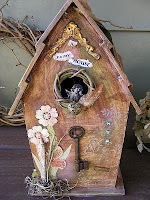 I have created a "mixed media fairy bird house" and a whimsical little fairy called "make a wish". My wish is to have Spring hurry up and get here!!! We want to do some plantin'. I can just feel the dirt between my fingers now. Sweet inpatients, daffodils, holly hocks, and lets not forget those adorable, always smiling back at ya, Pansies. Oh, was I supposed to be talking about the Humble Arts? Whoops! Yes, these gals have worked their fingers to the bone, one broke her finger and she is a hair dresser. Ugh, poor dear. But they have fabulous, wonderful, and even groovy offerings for you to see. So get yer but.........over there and take a gander. You won't be disappointed, I promise. Our new offerings can be viewed Sunday, March 1st. Have a glorious day! Good morning! Aren't you longing for Spring and gettin' to do some plantin'? I am so longing to get out side and feel the warmth on my face. These little bunnies are feeling the same way. They are longin' to plant some herbs, carrots and cabbage but Winter is determined to hold on. 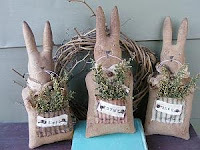 These bunnies are for sale at "Lemon Poppy Seeds" and so is their pattern. They are easy to make and you can make quite a few in a short amount of time. Loads of bunnies for everyone. So hold on and hunker down, Spring is on its way. Good morning. Meet Iva mouse. 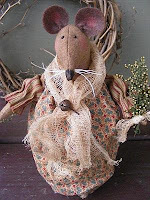 She is my latest prim mousy that has sold just recently on Lemon Poppy Seeds. Everyone seems to really like these little gals. I was looking through some other sites and saw how fast these mice were selling and just loved their sweet little faces, so I new why. So off I went to my attic to create Iva mouse. Iva mouse is cousin to Betsy mouse, who sold just as fast. Hum....I think I will be making more mice. My next mouse will be a birthday mouse, clown like. I want to offer that one on my Humble Arts site. So I will keep you posted. Squeak, Squeak, does anybody have some cheese? LOL! Today is the day of Looooooooooove!!! Do you feel it?!? We should be kissin' and a huggin' everybody we know today! It's time to show all those that matter in your life how much you care. It's not that we don't care more for them today, it's just that we get to be really mushy with the ones we looooooove especially today! I like that. It's a great option and I plan on smoochin' everybody I can, especially my son who tells me regularly "no kissy, no huggy". Yep, that's my boy. He doesn't like that mushy stuff but he is not gettin' off the hook that easily today, no sir!!! I wll be kissin' him all day long and stealin' a hug or two. My daughter is just the opposite, she is very huggy and kissy even at 16 years old. Well, not as much as she used to be, but still lovey for sure. My dogs and cat are always lovey and I get plenty of licks from them especially when I have food in my hands. LOL! So I hope your day is wonderful and you get plenty of "kissys and huggys" and be full of the looooooooooooooove thing. Happy Valentines Day!!! Labels: "no kissy, no huggy"
This morning as I read through "Where Women Create" and processed how these women became so successful I pondered my plight, "can I too be as successful"? I want to know if it is possible for me. It seems that every time I push to get my business off the ground something major happens in my life and I get side tracked. Last year I lost my dad, this year my mother is very ill and in the hospital. Dare I say "what next"? If I can't be up in my craft room working, then nothing is getting done, therefore no chance of my business growing. Feeling a bit frustrated today. The how, what, where, why and who's are running through my mind. How do I move my business forward, what do I need to do to make money to help my family, where do I begin, why can't I get this business moving and who's shop or magazine or on-line site should I advertise on? I know I'm not the only one who has contemplated these questions. But it is constantly running through my mind. God seems to be increasing my skill level, thank you Lord, but if I can't move my business out of the attic, so to speak, then what good is this new found skill? It is true, I am inpatient for sure. I want it now but I have viable reasons for that. My husband is out of work and has been for some time. My mom is in the hospital and now my daughter has the flu. I am needed home not at work somewhere. But I need to make the cold hard cash $$$. So time to stop complaining and hit my knees and talk to the Lord. These are hard times and many people are in my boat. So I'm not rowing alone for sure. So it's time to trust that God has my business in his hands and it will move forward in his time not mine. Lord help me to trust you and believe this love for what I do and these new skills are not in vain. Amen. Labels: Can my business grow? Good morning world. God is so good. He has helped my momma get help and she is feeling better. She is not well but getting the treatment she needs to get better and that is a blessing. This morning I am enjoying listening to the birds sing even though it is still cold here in West Va. Today it is supposed to be 50 degrees or more and I am looking forward to that. I can't wait for Spring!!! How I long for flowers, birdy's tweeting, and the smell of fresh cut grass. I hope to get crafting some dollies and photographing some of the items that need to be posted on my Etsy site. A new dolly is on her way, but we will see, the day is still young and I have to return to the hospital to check on my mom. I am so thankful that my family has rallied to help me but I do most of the running. As Dori on "Finding Nemo" says, "just keep swimming, just keep swimming" to find their way, I will do the same today. Spring, please come soon!!! God bless all. I think that statement is so true. I am adult sitting my mom now. She is 75 and having severe back problems. It is so hard to sit here and watch her in pain and taking medication that doesn't seem to help, even though it is some of the strongest pain meds on the market. She can barely do anything and it is breaking my heart. This is a very sufficent woman, she was very capable of doing just about anything and smart as a whip. But the pain is winning. We are taking her to the specialist for the back pain, she has a compressed fracture. She is getting an MRI Thursday and we will see what happens from there. To watch someone you love in so much pain, the feeling of helplessness is just overwhelming . You want to do everything for them, even take the pain away if you could but this is life.....sometimes. I don't mean to be so blue today, but I feel if I don't get it out, I may explode. So as I get older and my aches and pains start, I try to remember that one day they will be no more. One day I will be with my heavenly father and all those hurts, phyiscal and mental will be gone to be remembered no more. That is the hope I have for my mom. She is not ready to go, she just wants to get well. So if you have a moment today, please say a prayer for her. Have a beautiful day!